I’m not gonna lie to you folks, there was a lot of napping going on this weekend. 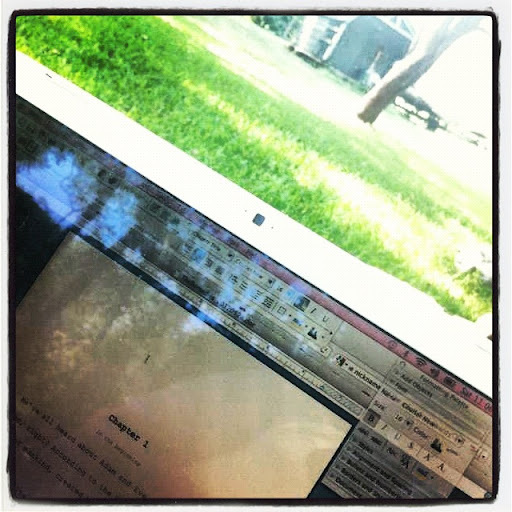 Also, I did some sitting outside, with my notebook and computer to work out some plot issues on my current WIP. Yeah, the work-in-progress that was showing no progress because I wasn’t working on it? That’s the one. Well, I decided to work on it some. I love to write, I love to create, but sometimes it’s like exercising for me. If I don’t do it almost everyday, I start to dread it…I start to feel like I’m not good at it anymore, I totally psych myself out. The good news is, I had LOTS of plotting help from the girls. Like the old school pen and ink to paper plotting method I was using? That’s how I roll, baby. Ruby and Trinity didn’t approve of my Luddite method, but they stuck around to assist me anyway. Now I just have to keep it up on a daily basis. Y’all don’t let me get distracted by the sparkly things, the squirrels or the internetz…okay? 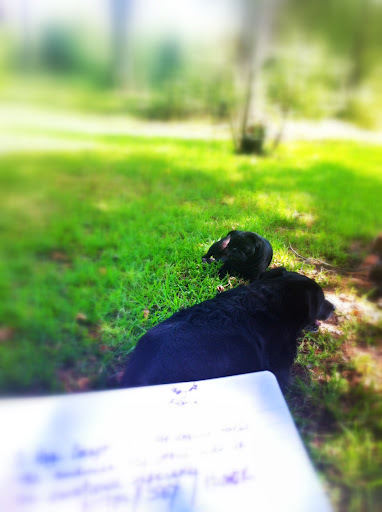 This entry was posted in Uncategorized and tagged iphoneography, the 4-legged family members, weekend, writing by Just Call Me Mel. Bookmark the permalink.